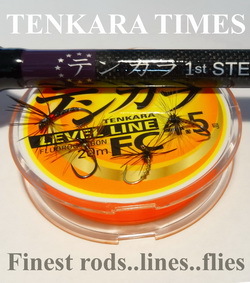 A couple of days ago, bamboo tenkara rod case maker Richard Kolodny came by Tenkara Talk H.Q. to show me some of his new designs. Richard is truly an artist and his cases (inspired by samurai sword sheaths) are simply gorgeous. I asked Richard to tell us a little more about their history and what goes into making them. 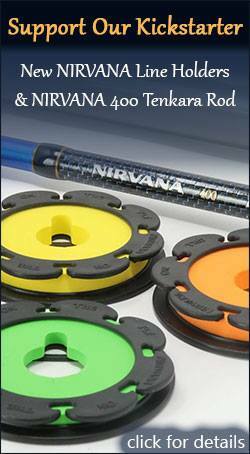 You can learn more about his tenkara rod cases and see a video of how they’re made on his site, Flyfishing Artwork. Jason: Making bamboo cases for Tenkara rods is a pretty niche craft. How did you get started? Richard: I have always had a great appreciation for the Japanese culture. Just as “A River Run through it” sparked a great deal of interest in Western fly-Fishing. Tom Cruise in “The Last Samurai” had really re-ignited my interest in the Japanese culture. The search for perfection in whatever they are doing, and the simplicity of life. This had led me to study “Miyamoto Musashi’s “Book of Five Rings.” Later on an article appeared in the Denver Post about Tenkara, which my wife cut out for me. It seemed perfect in its approach to fishing. I had come to realize that if my 50 years on the water had taught me anything it was that it all came down to presentation. How very simple, how very true I thought. I then purchased my first Tenkara rod, and it arrived simply in a sock. I don’t recall exactly how it came to me but I started calling stores trying to locate a stalk of bamboo, Pier 1, Michaels, etc. and then I found some in a garden center. I ran down on my lunch break bought an 8 foot piece and took it home with absolutely no idea as what to do next. I have been a woodworker most of my life so I just went to work at it. It was kind of crazy. 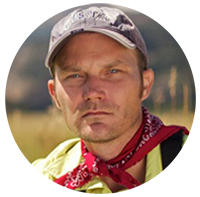 Jason: Do you build them only for Tenkara or for conventional fly rods as well? Richard: I have built, and offer rod cases for conventional fly rod cases on my website. They will fit 3-4 piece 9ft sticks. They are available in some local shops in the Denver area. I must admit my passion though is for the creation of the Tenkara cases. Jason: Walk us through the process. How does a humble piece of bamboo get transformed into something that looks like a museum piece? Are there any specific challenges involved with the tools or materials? Richard: First, I inspect the bamboo for cracks, and imperfections, prior to cutting them to their desired length. I view some imperfections as the character of the wood and incorporate them in the design. I try to get a sense for what I want to see as far as balance, and symmetry in relations to the spacing of the node membranes, but in all honesty everything can change once I begin working with them in the studio. The wood is sanded with several grades of sandpaper, and the internal nodes are drilled out, filed, and sanded smooth, all with tool I had to make by hand. They don’t sell four foot drill bits in Home Depot. All the tools I designed and are hand made. The “Fire Bamboo” cases are given their designs with torches, creating a caramelized feel to them. I then would wrap various materials to create a carrying grip for them. Having been a woodworker, and frame shop owner for most of my adult life I have always refinished wood, made frames, gilt them. I have a good understanding of finishes and patinas. As with any artist, your work evolves, through experimentation and new ideas. I turned to Japanese sword makers studying their processes, and tried to humbly take a fraction of their craft and apply it to my work. This has led me to the painted finishes on my latest cases. I have been most fortunate to work with a fellow artisan on creating the engraved imagery found on my cases. It is through this collaboration, a mentorship so to speak, that has elevated my pieces to what they are today. I prepare the wood, then they are engraved, and my creative process begins. Honestly, they come to life on my workbenches. Each piece builds on the last. It is truly an evolving process for me. Jason: When we first met, you showed me a plain bamboo case with some simple jute cord wrappings. But since then, your designs have become much more elaborate, including flaming, beads, painted finishes, and engravings from Japanese folklore. Where do you get your inspiration to design a case a particular way? Richard: I study the art of the Japanese sword makers. It is quite amazing. Each component is an individual’s lifetime devotion to that particular craft. 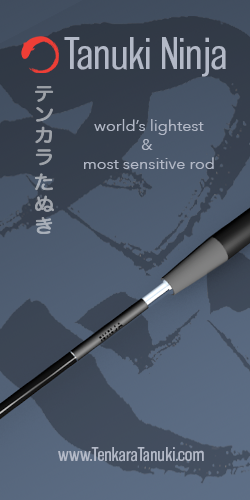 From forging metals, to lacquering the saya, each component is elevated to an art form. Naturally, as I study, I learn. I learn techniques, use of materials, and the origin of Japanese imagery. Netsuke are miniature sculptures originally carved from ivory, or wood, and were used as pendants, and toggles found on inros or medicine boxes, and tobacco pouches that hung from a sash. They are invaluable sources of imagery, as well as the rich history of Japanese folklore. Jason: Looking over the engravings you put on your cases is like a getting a Japanese culture lesson on anything from elements of noh theatre to mythical creatures like kappa. Are you a Japanophile or do you just do it to give your cases an aesthetic connection to tenkara’s roots? Richard: I wish I were, but for now I am merely a student. I am just a kid from Connecticut who has always had a great deal of respect and admiration for the Japanese culture. As my cases evolved, it seemed only natural to research and study what I considered similar art forms. Learning the fundamentals of sword making seemed to be a natural progression in that there was imagery, wrapping of various materials, lacquering, and adornment of the finished piece. I have taken from these disciplines and attempted to present them in my work. Jason: I referred to your cases as “museum pieces” above because they truly look like they should be behind glass and velvet ropes–which begs the question…do people actually take them out when they go fishing or do most people keep them on a mantle in their living room? Richard: They didn’t always look as refined as they do now, as you know. Initially, they were very simple, and organic. I tried to create a case that a village craftsman might have fashioned 150 years ago. One thing let to another, forging led to the “Fire Bamboo” and then the study of sword making led to the painting, and lacquering. Having done water gilding on picture frames most of my life the gold seemed a good fit. The gold tones give them a richness, and brilliance. I somehow thought they would wind up where they are now, a beautiful presentation case reminiscent of a Samurai sword. I had always thought they would be for presentation, and be displayed as an artifact, or sculpture, but many of my clients take them to the river. .I think of the as works of are, and deserve to be displayed for people to see. There is so much going on that pictures don’t capture, the revealing of layers of color, the glistening gold within the engravings, and the engravings themselves all deserve to be explored. 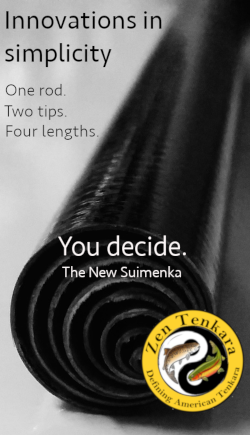 People come over to your house and see them they will want to pick it up and study it, man, what a conversation piece, what a great way to talk about Tenkara. They do look like museum artifacts, and for me that is an incredible compliment. Having said that, bamboo is pretty sturdy, you can toss them in the trunk of you car if you want to. Jason: Do you have any plans for new designs in the future? Isn’t that the best part of tomorrow, you just don’t know. I am quite satisfied with their presentation as it stands now. This is a creative process, not a manufacturing process. Each piece teaches me something, whether it is patinas, new lacquering techniques, even mistakes, it is all a learning process. Some of the best cases were born from mistakes. Some wind up as tomato stakes. I keep a journal of each piece and the techniques used, and employ what I feel worked, and employ it going forward. I am always thinking about new techniques, color schemes, materials, etc. But for now, as a body of work, I am pleased. Jason: Thanks Richard! It was interesting to get some behind-the-scenes info on these beautiful cases. If anyone is interested in purchasing one, they’re available here and here. Wow, those are beautiful. I remember first seeing these they were rather plain in terms of appearance, now with all of the carvings and designs…stunning! Thanks for posting an interview, great to see how someone comes along and develops their craft. Amazing! I am drooling. I may need to drive down to Denver to see them in person. An, I’ve got a few at my house. You’re welcome to check them out any time. Sweet! Some real nice work there. Makes me want to break out some large bamboo that I’ve got on hand…. Thank you so much Jason for sharing this interview. The rod cases are works of art. Beautiful! The only problem that I think of is backpacking with one of them, especially when you’re hiking long distances (space and weight). No doubt you can impress fellow anglers. Definitely, I would love, one day, to get one of them, just to have it at home as a piece of art. Martin, these definitely aren’t practical for backpacking and they’re not meant to be. 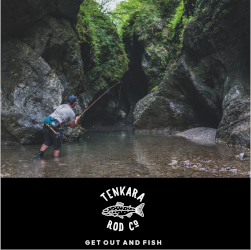 I don’t even bring a case when I take my tenkara rod on a backpacking trip. I just stick the rod in the side pocket of my backpack. Cool – thanks for sharing – as an amateur “artist” (I use the term lightly) – I really appreciate seeing a little behind the scenes of a craftsman in action. I’ve always loved the process of making things, more than the end products really, and it seems like Mr. Kolodny has a real love of process too. Very nice end product though! Outstanding article! This is an amazing art form! My complements to both the artist an author for such a great read! ok your site is the closest thing I’ve found in relation to what I have, I’m hoping you can direct me further. I have come into possession of what I believe to be a very special piece. It is a Japanese hand painted bamboo fishing pole/walking stick. It has a bone or ivory tip and handle which holds the bobber line and hooks. Can you direct me to anyone knowledgeable in such an article.